Let’s say you have a cup of coffee in the cafe. The coffee is clean and sweet, with a bright acidity. It’s balanced and enjoyable. As it cools, the coffee becomes sweeter and the acidity changes subtly. You buy a bag and take it home. Using all the right tools for the job and following your favorite brew recipe, you nail the pourover. You take your first sip. It’s dull and flat. The acidity is harsh. The overwhelming note present in the cup is one: coffee. What did the barista do that you didn’t? Is it worth buying the best coffees for home if you can’t make them taste the same way at home? Coffee brewing is chemistry. Since making coffee is all about proper extraction, (moving all of the good flavors present in the coffee bean to the water/coffee solution) coffee makers should work to optimize how coffee flavors are extracted from the beans and preserved and perceived in the resulting cup of coffee. Variables like time, temperature, particle distribution (grind), the ratio of water to coffee, and agitation during the extraction process all help extract flavor, but it is actually the composition of the water itself that extracts flavor from the coffee bean. 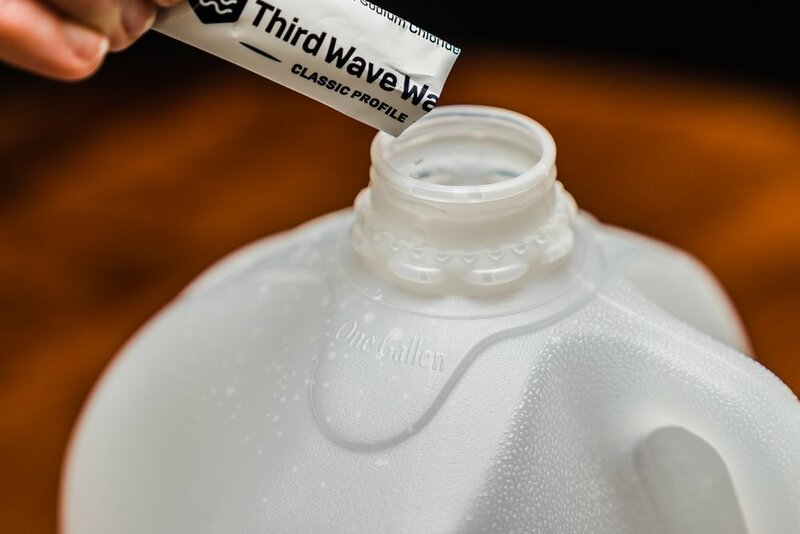 Companies like Third Wave Water are working to take the research being done by coffee professionals and make it accessible to the average consumer. You can find Third Wave Water Packets for Pourovers and Espresso in the shop. The team at Barista Hustle has some great info on making your own water recipe if you’re interested in learning more about how various coffee professionals optimize their water with easy to use recipes. Have you ever been disappointed by a coffee at home that tasted phenomenal at the shop, even if you nailed the recipe? Don’t fret! It could just be your water! With a desire to bring the same standards of specialty coffee in a cafe setting to your home, Taylor Minor and Charles Nick launched Third Wave Water. After a successful Kickstarter campaign and receiving a $100,000 investment on Shark Tank, Third Wave Water has made finding quality, consistent, coffee-brewing water easy to use and easy to find! Coffee is 98% water. Coffee is a solution that uses variables like time and temperature, as well as the mineral composition of the water to extract all of the acids and sugars from the coffee bean and into your cup. Water’s mineral composition varies dramatically based on location, filtration process, and piping. This means that in many cases, your morning cup of coffee is entirely dependent on the quality of your water. Even filtered water contains variable amounts of minerals and cannot provide a consistent product. Should home brewers invest in expensive, coffee-focused water filtration systems or turn into a chemist and create their own water recipe? Using distilled water and a packet of minerals from Third Wave Water, you can have cafe quality water to make cafe quality coffee at home. Each packet contains Magnesium Sulfate, Calcium Citrate, and Sodium Chloride to provide your water with a precise and consistent ratio of minerals to bicarbonate which allows the acids and sugars in the coffee bond with the water and preserve the clean, bright flavor specialty coffee aims for. If you brew coffee at home, we want to provide you with everything you need to make the best cup of coffee you want to make as simply and as replicable as possible. With a gallon of distilled water (which can be found at virtually every grocery store), and a packet of Third Wave Water, you can elevate the clarity of your cup and move on with the rest of your day. It’s simple and effective. We sell both Third Wave Water’s Classic recipe and their Espresso recipe in the shop. If you’re interested in what it could do for your home brewing routine, ask one of the baristas next time you stop by!